end of All Hallows by the Tower. click to see full view. The first thing to observe about the acacia is that its bark is rough, not unlike the bark of the poplar. It is important to note what is meant by rough; as with all terminology, tree terminolgy is specific to itself. The other thing to note, if you visit at the right time of year, is the small oval shaped leaves which are formed in pinnate compound style (see tree identification section). 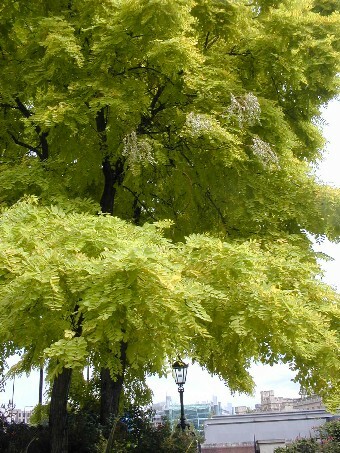 The acacia is similar to, although it is bigger than, the honey locust, which can also be seen near the Tower of London in Seething Lane. In fact, sometimes the acacia is referred to as the black locust. Leaf: the leaves are pinnately compound and are oval shaped. It comes into foliage relatively late. nuts: bean like pods which remain on the tree until they fall in the spring of the following year. small, white; droop in bunches, but the individual flowers are very small. bark: rough, dark brown with strong ridges. shape: grows to about 25 metres; often twisted, often with more than one trunk, vertical. general: Everything seems to dry first before falling off this tree, the petals, the nuts, the leaves. Having one of these around requires a lot of sweeping . on the east side; to the right as you enter.